What is the Statute of Frauds and How Does It Affect a Contract? In essence, the Statute of Frauds refers to the requirement that some types of contracts need to be in writing and signed by the parties in order to be valid, otherwise they are not enforceable. 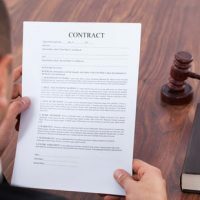 It’s important to reach out to a knowledgeable Florida business litigation attorney if you feel you’re dealing with a contract that is unenforceable, as contract interpretation can be a very complex matter. Agreements that are cannot be performed and completed within a year fall under the Statute of Frauds. The easiest example would be an agreement to supply a product to a customer over a two or three-year period. On its face, it’s already past the year period, because a two-year contract cannot be completed in 12 months. The caveat with this section is to remember that the contract has to be one that cannot be completed in a year. This means an agreement that physically could’ve been completed in six months but took 14 months is not one that falls under the Statute of Frauds in most cases. Any promise of consideration in exchange of marriage must be in writing. This means promises like “he/she promised to buy me (specified item) or promised to take me to (specified destination) if we married,” must be in writing or they will not be enforceable. Any agreements that have to do with land transfers and/or purchases also must be in writing, no matter what the price is. Agreements involving the buying, selling, or transferring of land are covered under this requirement. Renting or leasing agreements may not be required to be in writing since they are just the right to temporarily use the property. However, remember that a rental for six months can be oral, but an agreement to lease for two years falls under contracts that extend a year and would fall under the Statute of Frauds, requiring a contract in writing. Any sales for goods that exceed $500 in value require signed contracts. Under the UCC, or the Uniform Commercial Code that typically covers the sales of goods, goods worth $500 or more are subject to an agreement in writing. Like other sections, there are some variances here. This may include something for $750 that was modified down to $450, which can now be oral, or a $200 contract that was modified up to $550, which would need to be in writing. When someone becomes a surety, or acts as the guarantor for another party’s debt or obligation, it must be in writing. Issues with estate law where an executor agrees to pay estate debts from private funds must be in writing. Promises to pay estate debts from the estate’s funds can be oral however, and are not subject to the Statute of Frauds. Please contact the Law Office of McCabe Rabin, P.A. if you’re dealing with a complex contract agreement or have a legal dispute regarding a business contract. Our West Palm Beach attorneys are prepared to assist you today.